The pilot of a small plane experiencing engine failure safely landed on a grassy area in the middle of Highway 101 near the San Martin Airport in south Santa Clara County Sunday morning, according to the Federal Aviation Administration. Thom Jensen reports. 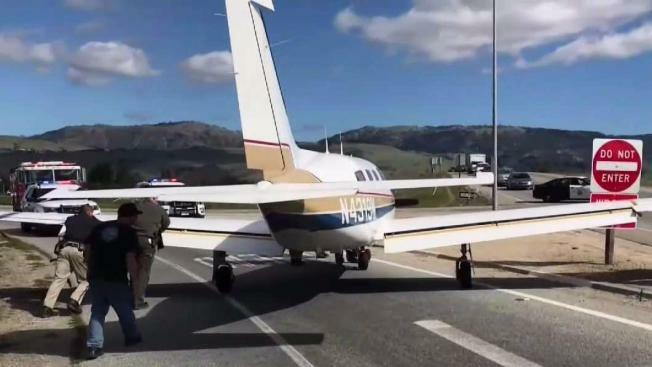 The pilot of a small plane experiencing engine failure safely landed on a grassy area in the middle of Highway 101 near the San Martin Airport in south Santa Clara County Sunday morning, according to the Federal Aviation Administration. Wayne Wright, who was the only person on the single-engine Piper PA-46 aircraft, was not hurt, FAA spokesperson Ian Gregor stated. The plane also escaped without suffering any damage. Wright, who said he's been flying for about 40 years, was headed from Davis back to his home airport in Watsonville when he said the plane malfunctioned. Air traffic controllers instructed Wright to land at the San Martin Airport, but he couldn't make it. He decided Highway 101 was the next best option. "My wing tip was out into the number one lane, and a couple of cars moved over to make room for me," Wright said. "I'm sure it's a day they'll remember. Everything worked out fine." Wright and others spent some time towing the plane off the highway and maneuvering it around road signs and other obstacles before stationing it at the San Martin Airport. The startling and surreal scene triggered backups on Highway 101 in both directions for a couple of hours.